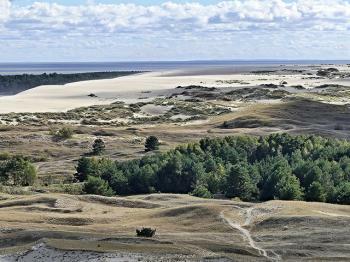 The Curonian Spit is a narrow sand dune peninsula, preserved from erosion through human efforts since the 19th century. The preservation was started by the Prussian State Land Management, who set to stabilizing the dunes by building a large sand wall and reafforestation. After World War I and the retreat of the Prussians from this part of Europe, the 98 km long area became divided between Russia and Lithuania. The peninsula separates the Curonian Lagoon from the Baltic Sea. As a continuing cultural landscape, it contains a number of 19th century fishing settlements along the coast. At the end of the century – when the Spit became a recreational centre - they were joined by more elaborate buildings such as lighthouses, churches and villas. Also there are archaeological sites such as buried villages (covered by sand) to be found. The Curonian Spit always has been a bit of an enigma to me. Who were these Curonians? And what is a Spit anyway? The Dutch translation (‘Schoorwal’) did not really help me as it is also a very uncommon word, used primarily to adress the Curonian Spit. So I was happy that we decided to have our WH meeting in Vilnius this year: with a few extra days I could check out this WHS too. 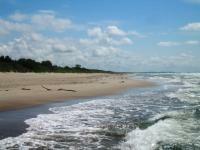 I stayed for two nights in Klaipéda, the easiest access point to the Lithuanian part of the Curonian Spit. Besides its name, another part of the site’s mystery is why it was designated a WHS. It was put forward under 7 natural and cultural criteria. But in the end it was only recognized for one: the efforts, started by the Prussians in the 19th century and continued by the Lithuanian and Russian authorities after WWII, to save this sand dune peninsula from erosion. Constantly moving sand dunes even had made whole villages disappear. Large-scale (re)afforestation was started to keep the sand in place. 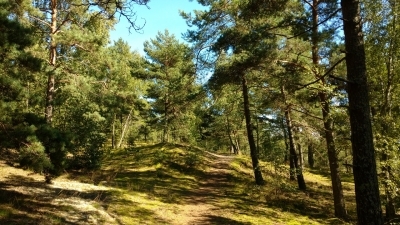 Forest still is one of its main features: my first impression of the peninsula was driving by bus from Smitylne to Nida. Especially the first half hour or so goes on a narrow road through a dense forest. The Lithuanian road ends after 50km in the town of Nida, close to the Russian border which unfortunately cannot be crossed easily (one needs a Russian visa and a mode of transport). Nida is the site of the Spit’s no. 1 landmark: the Parnidis Dune. That’s where I headed for my first hour of exploration. It’s a fine walk, with the bonus of a bit of warm sand between your toes. The scenery reminded me of the islands in the Dutch part of the Wadden Sea, the most comparable WHS to this one. The Curonian Spit also shares the nuisance of high visitor numbers in a relatively confined space with it. Lots of families with young children were trodding along on the interpretative trail to the Parnidis Dune. And at the top it got even worse: there is a bus parking at the back. Literally hundreds of cruise ship passengers are offloaded from their buses all day long, to be allowed a glimpse of this work of nature too. Back in the village of Nida I visited an old fisherman’s house. It is a reminder of the life of the Curonians, who lived in this region until they merged with other Baltic tribes in the 16th century. Via a video display you can witness the last two men speaking the now extinct Curonian language. Next to the house is an exhibition of colourful Curonian weathervanes. Sculpted from wood, they were not only useful for the sailors to see which way the wind was blowing but also indicated the people ashore from which hamlet they came. For lunch I had put my sights on the local specialty: smoked fish. For 5 EUR I got a large smoked mackerel on a paper plate, which I enjoyed dissecting. With this boost of energy I walked to the other end of Nida, where I had a look at the old cemetery. The graves here are specifically mentioned in the AB evaluation, so this is an aspect not to be missed. The gravemarkers are cut from timber into designs of flowers or human silhouettes. It’s not exactly that the cemetery is full of them, but I found a few. On my way back to the ferry to Klaipéda I made stop in Juodkranté, the second most important town of the peninsula. It is a historic seaside resort, with lots of early 20th century wooden villas. It also is home to the 'Hill of Witches', where artists have shown their woodcarving skills via timber sculptures depicting local legends. It's a bit of a tourist trap, but some are nicely done and it is a fine short hike through yet another part of the forest. Before World War 2 the Baltics had a substantial German population. Germany proper extended all the way to East Prussia with its capital Königsberg. But many Germans also settled further North in the Baltic states. Indeed, most places in the Baltics also have historic German names (e.g. Reval for Tallinn). And plenty of historic figures were of German ancestry. Take our beloved Struve Arcs. Struve was German and taught at was then a German university in Tartu/Dorpat. As such, travelling the area you will meet plenty of Germans trying to connect to their ancestors. The Curonian Split features quite heavily in these itineraries as it was a prime travel destination of the locals; and still is. The Split itself is arguably man made. The Prussians intervened to stabilize the dunes and protect it against the sea. It is this engineering feat for which the site was inscribed. Personally, I enjoyed hiking the woods, the beeches and the dunes, but felt a bit hard pressed to pin point the OUV. The old wooden tourist houses in the city center. The most prominent one used to belong to Thomas Mann. The big Parnidis dune South of the city. Thanks to Air Baltic plenty of locations in the Baltics are within reach and budget. Only caveat is that you will have to transfer at Riga. I flew via Riga to Palanga and took a bus to Klaipeda from there. The next day I took a morning bus from Klaipeda to Nida on the Curonian Split. I mostly stayed in and around Nida. I later learnt that you can do one way bike rentals to ride along the coast. The Curonian Split is too long to do it simply by walking. Getting to the Russian side meanwhile entails getting a visa. Looking across the border it seemed to be the far quieter side. Klaipeda (German Memel) used to be the Northern most German city and part of the Hanseatic League. Most of the old town was destroyed during World War 2. You can still find glimpses. Due to the German heritage you will meet plenty of German tour groups, primarily consisting of retirees. From Klaipeda you can travel on to Vilnius via Kaunas (T) or North to Riga. I visited this WHS in August 2016. I based myself in Nida for 2 nights just opposite the Horn of Bulvikis, the widest point of the spit (3.8km). Just next to my timber guesthouse serving delicious savoury blinis for breakfast, there was a pyramid marble structure with the UNESCO inscription plaque engraved on it. From there I followed the 1.7km Parnidis self-guided path in the Neringa National Park. 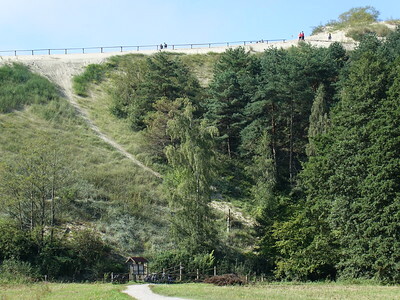 The highest point of this path is the 52m Parnidis Dune and sundial. The panoramic view of Nida and the rest of the Curonian Spit from there is beautiful especially at sunset and sunrise (when no tour buses are around). Since I had more time to spend, I decided to hike towards the protected nature reserve with several shrubs, flowers, plants and trees growing on the sand dunes. The landscape is quite surreal there and the peace and quiet priceless. Small passerine birds and sea birds thrive on this undisturbed stretch of the spit. There are fenced off areas towards the forests to prevent direct access to the Russian border, however if you carry enough water and keep on walking along the dunes closest to the lagoon there is a clear path which will actually lead you to the Russian part of the Curonian Spit. I walked at least 10km as the sundial and viewpoint were not visible any longer and I could clearly see the Baltic sea on the Russian side. Suddenly, as I caught sight of a Russian watchtower, I received a Welcome to Russia text message informing me that I was actually on 'Russian sand'. Happy that I technically visited both sides of this transnational WHS but at the same time feeling uneasy that I was probably trespassing without a visa, I hurried back to the Lithuanian side of the spit and on the way stopped to admire sunset next to a number of crosses and prayer flags in the sand which reminded me of the crosses placed by pilgrims along the route towards Santiago de Compostela in Spain. The next day I visited Nida with its old cemetery with different wooden crosses and the colourful weathercocks. The ferry service to and from the spit is very frequent and efficient and having your own car will help you enjoy both the lagoon area as well as the stretches of sandy beaches by the Baltic Sea. I am married to a Lithuanian lady ,we go there regually to visit her family. On one such visit we holidayed in Nida on the Curonian Spit.As an Englishman I have never seen the like in England.You sit down for breakfast in a modernish restaurant then take a walk for about a mile and you have gone back 200 years in time. For me the most peaceful and tranquil place on earth. The Coronian Spit is a 100 km long and 1-4 km wide sand dune peninsula in the south-east of the Baltic Sea, shared between Lithuania and the Russian enclave of Kaliningrad. On the western side of the peninsula you face the Baltic Sea and on the east side - the “inside” – there is a large lagoon. Just where the tip of the spit forms a narrow sound against the land, Klaipeda, Lithuanias major port is located. Or “Memel” as the town was known up until the end of WWII when then the population was predominantly German. Today it is 100% Lithuanian. I arrived to Klaipeda on a bright summer day, after having crossed the Baltic Sea from Sweden on a pleasant overnight cruise. Klaipeda was badly damaged during WWII but still have enough old buildings and charm to be a major tourist destination. Later jumping across the sound between Klaipeda to the Spit takes about 10 minutes with a small ferry that runs back and forth all day. On the Spit, buses are running up and down and 45 minutes later I found myself in the small village of Nida, close to the Russian border. It is in Nida you will find the famous Paradise Dunes, massive sand dunes which equals you probably have to go to Sahara to find. Walking on the sea side of the Coronian Spit was a peculiar experience. The sun was shining from a hot, clear blue summer sky and yet there was not a person in sight on this never-ending sandy beach. It was quite an amazing feeling to be completely alone in a place where - in our overpopulated world – you would normally find hundreds of people, lazing in the sun. The Lithuanian part can easily be visited by one of the hourly ferries from Klaipéda. It takes just 5 minutes to cross the lagoon, and a bus will be waiting to take you further inland. Lighthouses: Pervalka lighthouse on the small island at the end of the Zirgai Horn (1900); also one in Nida. Bird Migrations: Birds migratory flyway from North Europe to the of South Europe. Rybatschi holds the oldest bird observatory in the world. Lagoons: The Curonian Spit divides the Curonian Lagoon from the sea. Parts of the lagoon are within the inscribed area. Teutonic Knights: The Teutonic Knights occupied the area in the 13th century, building their castles at Memel (1252), Neuhausen (1283), and at Rossitten (1372). Amber: The village of Juodkrante (within the inscribed area) was a major source of amber on an industrial scale. Wiki : - "In 1860 Stantien & Becker company was founded to dig amber just north of the village. During 30 years of operations, it dug out about 2,250,000 kg of amber. During its peak the company employed about 1,000 workers." A significant collection of Amber items from the Neolithic and Bronze ages was put together by a R klebs but in the WWII period much got lost and dispersed. There is an Amber museum at Nida (marked on nomination file map) which contains copies of many of the itmes from the collection. Visited by Alexander von Humboldt on his travels: His diary states "...Where we stayed for 4 or 5 days and which yielded 5 shells and 3 lichens". Legends and Folk Myths: Neringa and the creation of the Spit: "According to Baltic mythology, the Curonian Spit was formed by a strong girl, Neringa, who was playing on the seashore." Built in the 19th Century: Criterion V: "massive protection and stabilization works begun in the 19th century and still continuing to the present day"
Cultural sites rejected for Natural criteria: "Concerning natural values, the Committee noted that the Curonian Spit is an important site at the European scale and very significant within the Baltic Region as a whole. However, it was not considered to meet the criteria for inscription on the World Heritage List as a natural property." 123 Community Members have visited.